Saturday in San Diego we will commission the second ZUMWALT Class destroyer, USS Michael Monsoor (DDG 1001). You can watch the ceremony live at this link 1pm Eastern, 10am Pacific. Not much more to say that the citation does for a young man of 25 years of age. For conspicuous gallantry and intrepidity at the risk of his life above and beyond the call of duty while serving as Automatic Weapons Gunner for Naval Special Warfare Task Group Arabian Peninsula, in support of Operation IRAQI FREEDOM on 29 September 2006. As a member of a combined SEAL and Iraqi Army sniper overwatch element, tasked with providing early warning and stand-off protection from a rooftop in an insurgent-held sector of Ar Ramadi, Iraq, Petty Officer Monsoor distinguished himself by his exceptional bravery in the face of grave danger. In the early morning, insurgents prepared to execute a coordinated attack by reconnoitering the area around the element's position. Element snipers thwarted the enemy's initial attempt by eliminating two insurgents. The enemy continued to assault the element, engaging them with a rocket-propelled grenade and small arms fire. As enemy activity increased, Petty Officer Monsoor took position with his machine gun between two teammates on an outcropping of the roof. While the SEALs vigilantly watched for enemy activity, an insurgent threw a hand grenade from an unseen location, which bounced off Petty Officer Monsoor's chest and landed in front of him. Although only he could have escaped the blast, Petty Officer Monsoor chose instead to protect his teammates. Instantly and without regard for his own safety, he threw himself onto the grenade to absorb the force of the explosion with his body, saving the lives of his two teammates. 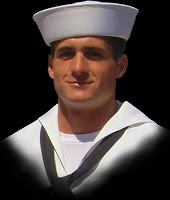 By his undaunted courage, fighting spirit, and unwavering devotion to duty in the face of certain death, Petty Officer Monsoor gallantly gave his life for his country, thereby reflecting great credit upon himself and upholding the highest traditions of the United States Naval Service.